"I'm going up to a 4 on ya!" Mean was formerly part of the notorious Angel Gang - Pa, Link, Junior and Fink - who operated out of the Cursed Earth. After they tangled with Judge Dredd, he's now the only surviving member! Mean originally was the black sheep of the family because of his gentle nature and loved picking flowers. 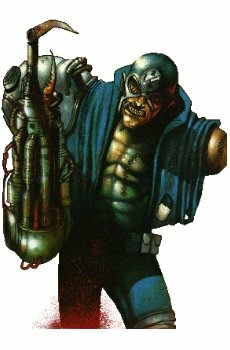 Pa Angel couldn't stand to see a son of his being such a wuss, so he ordered a surgeon to replace his right arm with a mechanical claw and implanted the dial into his brain, turning him into a violent nutcase!